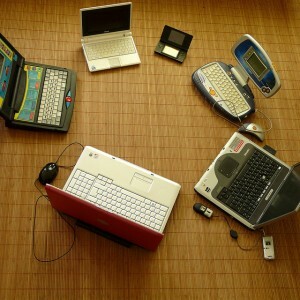 Computer games and mobile devices will be prevalent in schools within the next few years. Cloud computing and mobile learning: That's the way of the near future in education, according to the New Media Consortium (NMC) Horizon Report: 2011 K-12 Edition. Released by the NMC's Horizon Project, the report distills current trends, challenges, and emerging technologies in K-12 education. "There are so many things to pay attention to in the world of emerging technologies," says New Media Consortium CEO and Horizon Project founder Dr. Larry Johnson. "What we're saying is, 'Pay attention to this small list and you won't go wrong.'" The report is full of specific examples of what's really happening in schools, but Johnson recommends keeping a close eye on the following trends. Schools will start incorporating mobile, hand-held devices in the classroom in significant ways. Mobiles (read: smart phones), Johnson says, were placed "pretty far out" in past Horizon reports -- in the four- to five-year category, mostly because of policy concerns. "Schools didn't have the right policies in place to even think about it; [phones] were still considered disruptive," he says. But now, "we think mobiles are finally going to tip in education." Cloud computing will replace data storage on school servers because using free data centers that host thousands of servers, like Google, is becoming more prevalent. Not only are these cloud computing services more convenient for schools (Google Docs, for instance), but it's "increasingly seen as a way to save money," Johnson says. Games are gaining more traction in education -- primarily for the potential of highly sophisticated video games to "foster collaboration and engage students deeply in the process of learning." Open content is perhaps not yet as widely employed as cloud computing is to save money, but it's on its way: open educational resources have been offered by institutions as renowned as MIT for a decade and are increasingly seen in the K-12 community as a way to increase student choice and access to learning. It might still be far out, but there's a glimmer on the horizon that standardized tests may not be the only widely approved form of student assessment. Analytics technology is becoming sophisticated enough that schools may start providing personalized assessment systems for students over the next five years. And while a "personal learning environment" is still very much in its conceptual phase, the idea that "student-designed learning approaches that encompass different types of content" -- like videos, apps, games, and social media tools -- can meet his or her learning style and pace goes a long way to making education more personalized, and therefore effective. A NEW DEFINITION OF "THE DIGITAL DIVIDE." Today's digital divide is "less about the devices that you have than the knowledge and capability you have to use them when you need to," says Johnson. "We use the Internet as if it were air. Doing a Web search is something we do without even thinking. That, more and more, is how employers expect their workforce to be. The people who have those skills are going to be relatively more successful than people who don't." LACK OF DIGITAL MEDIA TRAINING FOR TEACHERS. Despite widespread agreement about its importance in schools, schools of education and professional development programs for teachers are still not providing the training necessary to make tech integration a reality. THE NEED FOR SYSTEMATIC CHANGE. "The fundamental structure of the K-12 education establishment" is one of the greatest obstacles to innovation, write the report's collaborators. "As long as maintaining the basic elements of the existing system remains the focus of efforts to support education, there will be resistance to any profound change in practice." This last idea is potentially controversial, but Johnson is matter-of-fact. "Everything about the way that teachers are evaluated and the way their work is evaluated is based on old models," he says. "It's really very difficult to change. When your lesson plans have to conform to a specific structure, and when your creativity is limited to making sure your students pass high-stakes tests, the ability of a teacher to encourage students to become self-directed learners is hampered." Nevertheless, he insists, "I'm an optimist in this. I understand that change takes time. Schools are not early adopters. They tend to look for technologies that are proven in the rest of the world -- in the business, entertainment, or other industries. Once they're established elsewhere, schools bring them in."